It is rare to find a disc of modern repertoire where all three constituent elements (the composition itself, the performance and the production) conspire to produce a work of amalgamated excellence. The anonymous 13-th century Norse Liknarbraut, detailing Christ's crucifixion, is set to perpetually shifting music, concurrently dramatic and mesmerising, by Plagge (b.1960). Under the masterful direction of Fevang, Ensemble 96 (spawned as a contemporary chamber group from the Philharmonic Chamber Choir of Oslo) performs with sumptuous warmth and clarity. 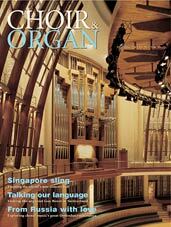 Reviewed by Choir & Organ May 2003.